Donald Cerrone (pictured) is admittedly dead broke and hellbent on staying active in order to replenish his bank account. 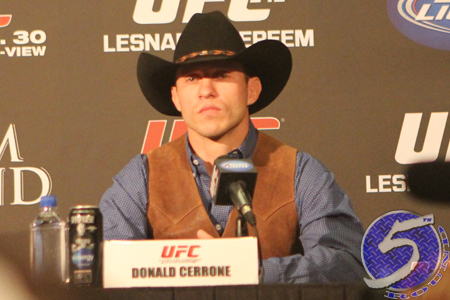 “Cowboy” got his wish Monday, as the lightweight will battle Edson Barboza at UFC on FOX 11. UFC officials confirmed the bout Monday evening. The April 19 event takes place inside Amway Center in Orlando, Florida. Cerrone is fresh off January’s highlight reel knockout victory over Adriano Martins. The 30-year-old has won three of his last four contests. Barboza, meanwhile, has bounced back from the lone blemish on his resume by rattling off four straight wins. The Brazilian was most recently seen in December posting a majority decision over Danny Castillo. The 155-pound shootout will likely appear on the main card. FOX broadcasts the night’s featured fights live starting at 8PM ET/5PM PT.